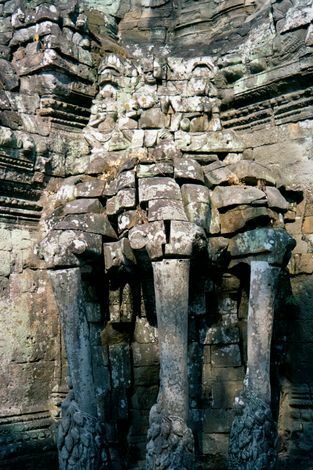 Like Egypt's pharoahs and the imperial rulers of China, Korea, and Japan, Angkor's rulers loved symmetry. 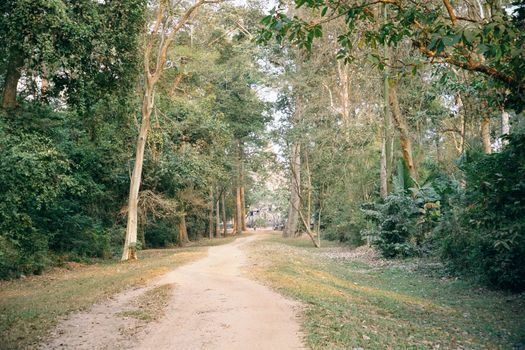 The road that runs along the western edge of Angkor Wat therefore runs straight north for a mile and, without deflection, enters the southern gate of Angkor Thom, literally "great city." Here again, as at Angkor Wat, the layout is rectangular and oriented to the cardinal points. 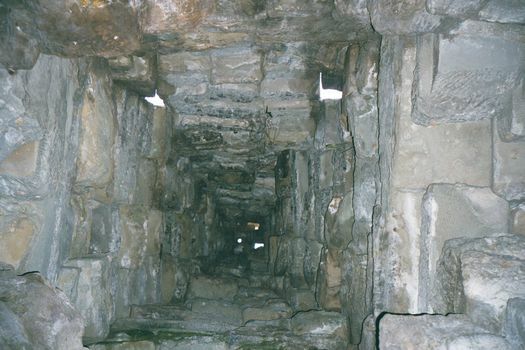 The scale is larger, however: the walls are three kilometers long on each side and enclose about 2,000 acres. 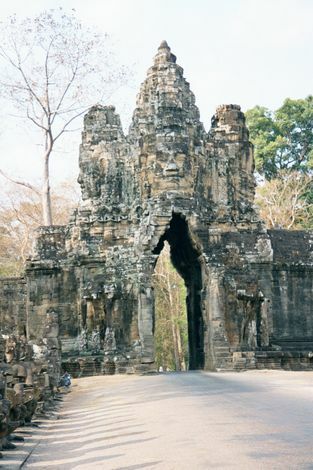 Entrances pierce the midpoints of the walls and converge on the Bayon, one of several surviving monuments in the city. 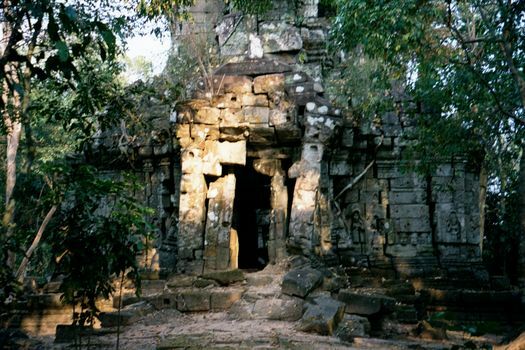 North of the Bayon there are palatial ruins that were once ceremonially approached through a fifth gate, piercing the wall about 500 meters north of the eastern gate and running straight west to the palace. The city walls are intact today, still rimmed by a moat, and marked at the four corners by identical though decayed towers. 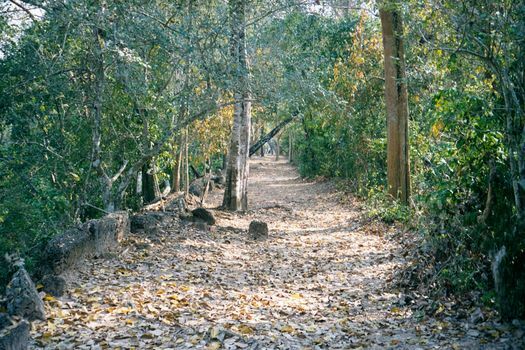 It's a lonely walk between them, and though it's difficult to get lost with such a clear layout it's easy to get temporarily disoriented, because the ground is flat and forested. The south gate, with a naga bridge over the city moat. The serpent's heads flare on the right, while lined-up demons or asuras pull on its body, tug-of-war style. The serpent straddles the moat, linking the secular and divine worlds of the countryside and the capital. More than that, the serpent may be none other than Vasuki. 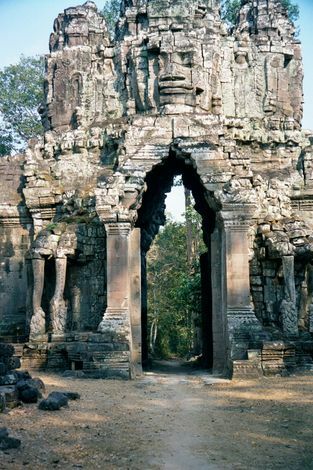 As such, it can be matched with an identical scene at the city's north gate: together, the gates can be read (as can those of the east and west gates) as the two ends of a body whose midpoint is wrapped around the Bayon, at the city center. 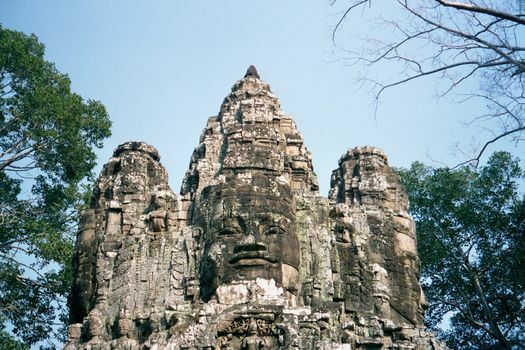 The Bayon thus represents Mount Mandara in an ancient creation myth in which the gods and demons together pulled on Vasuki for 2000 years. His body, wrapped around Mount Mandara, set the mountain spinning until the surrounding ocean of milk was churned to produce amrita, the elixir of immortality. Still at the south gate, but over on the other side of the road to show the city's 75-foot entrance tower, or gopura. 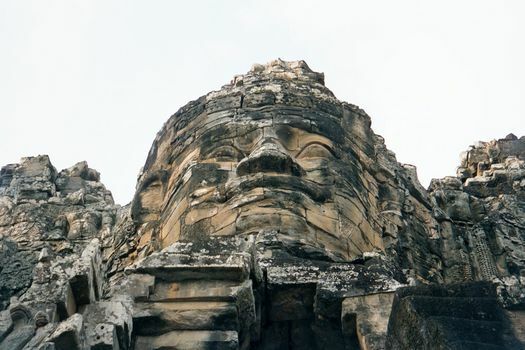 Atop the tower, four faces represent Jayavarman VII, the late 12th century builder of Angkor Thom. 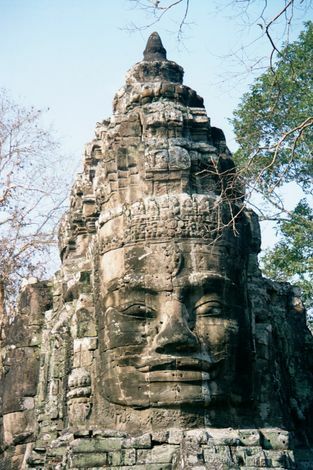 His face is on all the entrance towers, as well as all over the Bayon, and though the expression is mild, the political symbolism is totalitarian. 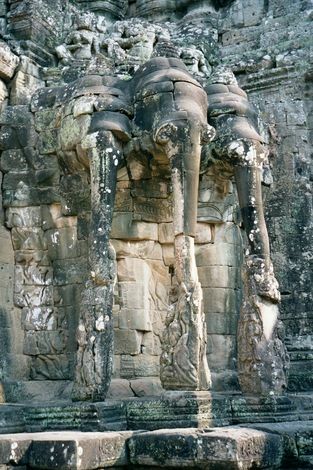 Three-headed elephants stand on either side of the narrow entrance; according to the myth, they too were created by the churning of the ocean of milk. A closer view of one such elephant: the riders (damaged) are the god Indra and his flanking consorts. The gopura faces. Orwellian, the faces observe you at every step. Viewed from atop the city wall. The lips may smile but not the eyes. The view up, as one enters the city. Paved and heavily used roads pass through the South, North, and Victory gates, but the East Gate, shown here, is little used; nor is the West. The stones on the East Gate are spreading, but the triple-headed elephant still plucks lotus flowers from the moat. 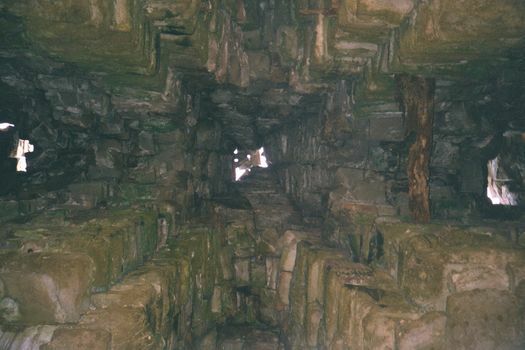 Inside the East Gate and looking up to reveal the corbelling. The comparable view in the Western Gate: a bit of a coffered wooden ceiling survives. 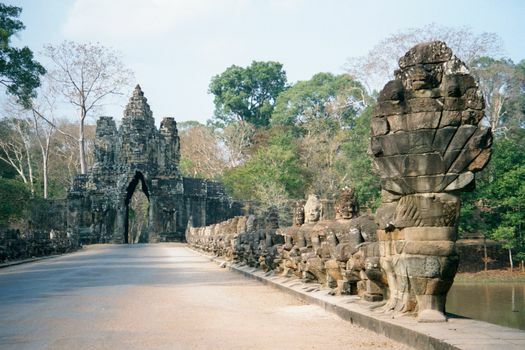 The main avenue from the Bayon to the Western Gate. Atop the north wall and heading to the northeast corner. 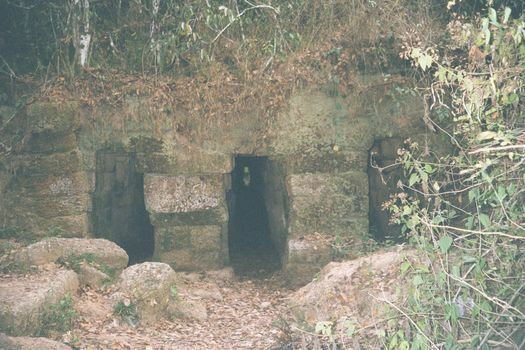 The walls are all 25 feet high and built of laterite. The material is ubiquitous. As a clay, it is easily carved as blocks from the earth, but it soon hardens into a very coarse rock. 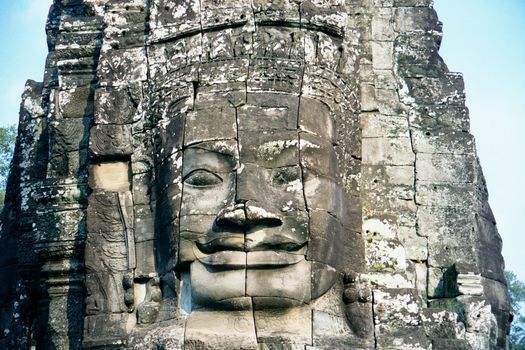 When used for construction at Angkor, it was faced either with sandstone or plaster. Here, it is left naked. 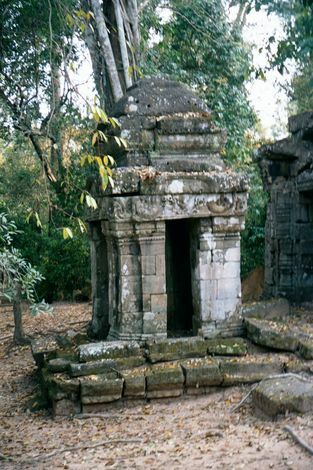 The northeast prasat chrung, one of four "corner shrines." Water enters Angkor Thom at the northeast corner and runs toward the southwest, where it exits through these tunnels under the southwest corner wall and flows into the city's moat. 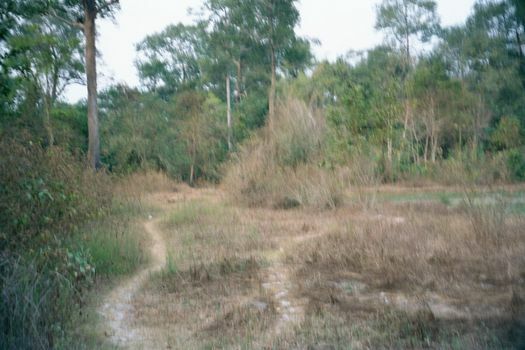 Some of the forest within the city has been cleared for fields; here, the edge of a field near the southwest corner. Hard to believe you're in what was the city? 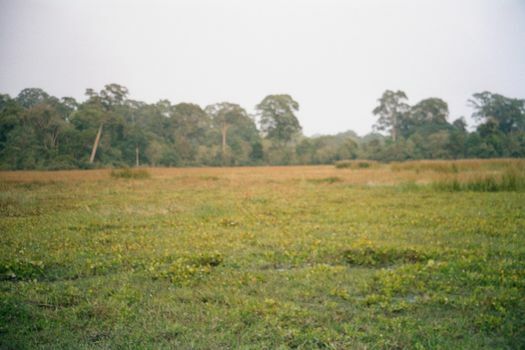 Still, you are: Angkor Thom was filled with the houses of officials--religious, civilian, military. They were all of wood and have vanished.